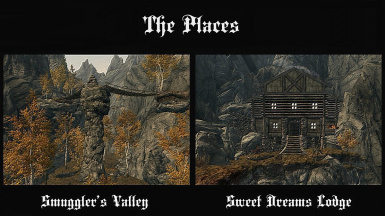 Artisanix for Paintings and Frames http://www.nexusmods.com/skyrim/mods/17423/? 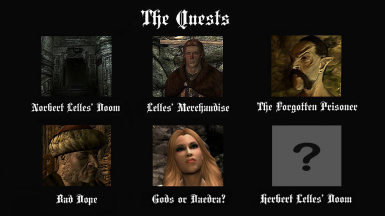 The intro quest to Herbert and Norbert Lelles in Skyrim. 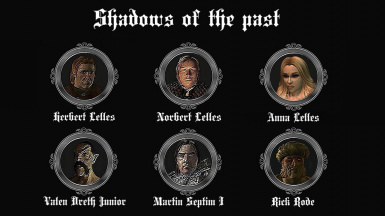 Herbert, offspring of a respectable Anvil merchant family came to Skyrim to track down the fate of his ancestor who left Cyrodiil for Skyrim 200 years ago. Queststart: go in a city or village and let the courier approach you. After completing quest 1 Herbert revives the Lelles family tradition and becomes available as a merchant (he also buys stolen junk). There are not many fences in and around Whiterun so it can be useful at times to have a low-moral merchant nearby. Queststart: right after quest 1. Herbert got a letter from a collector friend suggesting to retrieve an ancient 3rd era item. Unfortunally this item is owned by a long term prisoner who spends his days in a well guarded underground prison. This quest is inspired by the TESIV-Oblivion Dark Brotherhood quest "Scheduled for Execution" where you had to break in into the Imperial City prison (where you breaked out at the beginning of the game) to kill Valen Dreth. Queststart: talk to Herbert after he offered his merchant service. Herberts Skooma wholesaler contacted him telling of some unwanted Skooma smuggler activities near Riften. He wants the smugglers boss Rick Rode dead by an overdose to state an example for future junior Skooma dealers. This quest is inspired by the TESIV-Ovlivion Dark Brotherhood quest "Bad Medicine" where you had to replace the medicine of a fatally ill bandit named Roderick with poison. Queststart: right after quest 2. 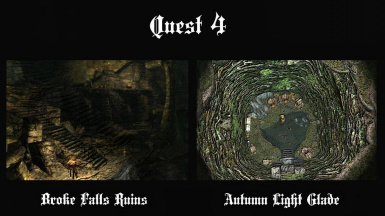 Quest 4 Gods or Daedra? Now that Herbert managed to get a bit wealthy he wants to take care of a problem that is bothering him for some time: his young wife Anna. Rumours tell that she's a devoted worshipper of Boethiah and Herbert wants to get rid of this problem permanently. This quest for a change is not inspired by any quests in TESIV-Ovlivion. Queststart: right after quest 3. 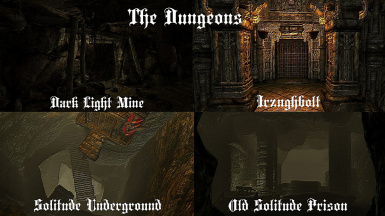 Adds a fully voiced questline with 5 quests and 1 subquest, some new custom dungeons (mine - Dwemer ruin - Imperial prison - Nordic ruin) and some new custom places like an outlaying valley and a smugglers lodge to the game. None. All enemies are leveled so it should be doable at any time. NMM or manual unzip and copy/paste the files in the data folder. There are 4 parts of the video on YT. Videos by Zero Period Productions. quest 2 the Forgotten Prisoner sometimes refuses to start. It's a well known bug in questmods and easy to fix. After Herbert offered his merchant service save the game and reload. Apachii for beautiful ApachiiSkyHair and the permission to use it http://skyrim.nexusmods.com/mods/10168/?